® D122 race details Two write-in candidate vie for an open seat for NLSD122 board, Page 6 Camaraderie in the community New Lenox Chamber’s Community Expo informs residents of local businesses, organizations all in one room, Page 10 The chosen ones Publisher 22nd Century Media reveals winners in Southwest Choice Awards special section, Inside new lenox’s Award-Winning Hometown Newspaper newlenoxpatriot.com • March 21, 2019 • Vol. 13 No. 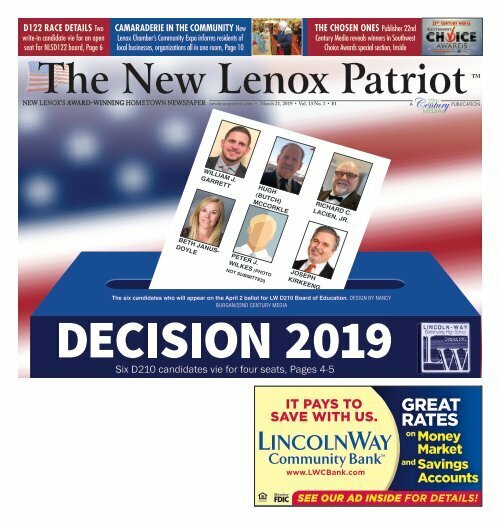 1 • $1 A Publication ,LLC William J. Garrett Hugh (Butch) McCorkle Richard C. LaCien, Jr. Beth Janus- Doyle Peter J. Wilkes (PHOTO NOT SUBMITTED) Joseph Kirkeeng The six candidates who will appear on the April 2 ballot for LW D210 Board of Education. Design by Nancy Burgan/22nd Century Media Six D210 candidates vie for four seats, Pages 4-5 IT PAYS TO SAVE WITH US. www.LWCBank.com GREAT RATES on Money Market and Savings Accounts SEE OUR AD INSIDE FOR DETAILS!